We offer several sizes of tanned raccoon skins. The garment grade skins are the best quality available anywhere. All the #1 skins have a decent body with a face and tail. These skins may come tinted or natural in color. The #2 skins tend to have bad or no faces, missing noses and ears, and may or may not have a tail. Measurements for size are from the nose to the base of the tail, not the tip of the tail. The widths of a sample large skin are: 5.5 - 6" (14 - 15 cm) for cased (like a sausage) skins, and 9 - 10" (23 - 25.5 cm) for uncased (or open) skins. Each skin weighs approximately 4 oz. Our Gxx codes denote individual skins. 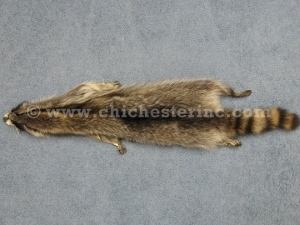 If you would like to order a specific raccoon skin, please go to our Gallery to pick the exact one shown. Raccoons are not an endangered species.